A few months ago while I attended Lucky FABB West I had the opportunity to meet the lovely and kind people from Tacori. After FABB they so graciously gifted each person a pair of stunning earrings of our choosing. I had selected the Sky Blue Topaz studs and when they arrived I was literally blown away. I have never in my life worn such a stunning piece of jewelry. The sky blue topaz is just so stunning and perfect for any season. The blue color reminds me to of summers at the beach with the ocean but yet the icy and sparkly look to them makes me think of cold snowy days and the glimmer of fresh snow flakes. My only problem with these earrings is that it has me wanting the matching necklace and ring that I will forever dream about. I promised I would only wear them for special occasions but each time I have them on I can't help but feel special and like a princess so they've turned into my everyday earrings. I know these earrings will be something I forever treasure and wear. 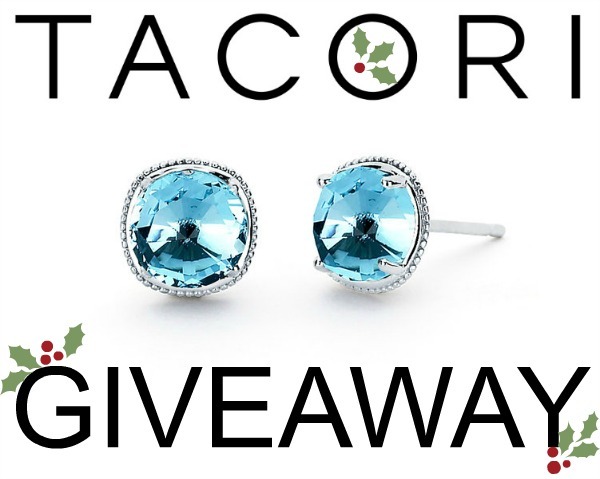 Because you are all so special Tacori is giving one lucky beijosTiffany reader the same pair of earrings I have-a gorgeous pair of Sky Blue Topaz studs (Retails- $250). You could give them as a gift but if I were you I would keep them for myself. Every girl has the right to feel like a princess and wear/own an amazing piece of jewelry. You must be a US resident. Giveaway ends Monday, December 17, 2012 at 11:59pm EST. the earrings look gorgeous on you!! Gorgeous earrings! What an awesome giveaway! Gorgeous earrings!! Thanks for the giveaway!